Placerville, CA – July 17, 2018…This weekend the Placerville Speedway is geared up to host another exciting Summertime Saturday night program with Red Hawk Casino championship point race number 12 on deck at the quarter-mile. The evening of racing entertainment is dubbed as “Night on the Water” and will feature various special activities in the midway, along with the usual Happy Hour at the beer booth from 4pm-6pm. The Thompson’s Auto Group Winged 360 Sprint Cars finally saw its first repeat winner of the season last time out in the form of Aromas, CA’s Justin Sanders. Five-time track champion Andy Forsberg of Auburn stalked Sanders late in the race and brings the point lead into this Saturday’s event. The driver of the Friends & Family Racing X1 has accumulated one victory so far this season at Placerville Speedway and hopes to add another this weekend. Hollister’s Tony Gualda continues to rank second in the standings while still searching for that first career Winged Sprint Car victory. The 18-year-old has been in the thick of things each and every week. Placerville’s Jimmy Trulli is coming off a fine third place effort last week and sits third in the points, with rookie drivers Shane Hopkins of Cameron Park and Jodie Robinson of Foresthill rounding out the top-five. Completing the top-10 are CJ Humphreys, Mike Cook, Mike Benson, Sanders and Steven Tiner. The Pure Stock division is fresh off one of the best races of the season last weekend, which saw outstanding side-by-side competition all the way through the field. Dan Jinkerson ended up claiming his third victory of the campaign at the checkered flag. If for not missing the first few races of the season Jinkerson would be right in the mix for a track championship. As it stands now Scott Grunert goes into Saturday leading Jason Palmer by 14-markers at the top of the standings. Kevin Jinkerson, Nick Baldwin and Tommy Sturgon rank third through fifth heading into the 10th point race of the season for the class. Rick Grunert, Chris Van Roekel, Ronnie Richards, Lonnie Lennard and Mike Stoeckle round out the top-10. The Pure Stocks have featured close and entertaining racing all year long. The wingless warriors of the C&H Veteran Ent. presents Hunt Magnetos Wingless Tour make their final appearance of the season on Saturday. The initial visit on April 28 was picked off by Stockton driver DJ Johnson over Scott Hall, Shawn Jones, Cody Spencer and Nick Larson. Overall this weekend is round number eight for the traveling series, which came into existence back in 2010. Following Saturday’s event there are still a couple of non-sanctioned wingless spec sprint races remaining on the red clay. Rounding out the card on Saturday will be the Mini Trucks with their fourth event of the season. John LittleJohn is the most recent winner in the class and brings the point lead into Saturday. Aaron Rupley, Chris Shaaf, Megan Curtis and Tom Stanwood are other drivers hoping to break their way into victory lane. The pit gate will open at 2pm, with the front grandstand gate opening at 3pm. A happy hour will be offered from 4pm-6pm in the grandstands featuring discounted Coors Light and Coors Original at the beer stand. Drivers meeting will be held at 4:30pm, with cars on track for wheel packing at 5. Hot laps, qualifying and racing will follow. The Placerville Speedway would like to thank all of its partners for their support this season including Red Hawk Casino, Hoosier Racing Tires, Coors Light, Thompson’s Auto Group, Absolute Auto Glass, ADCO Driveline and Custom Exhaust, Bear Republic Brewing, Beef’N’Brew, Capital Ace Hardware, Carol Russell Bookkeeping Service, Chris Kenner Racing Specialties/ Security Race Products, Campora Propane, Davies Family Inn, High Sierra Industries, Poor Reds BBQ, Les Schwab Tires, the Paint Spot, Riebies Auto Parts, Shadow Ridge Ranch, The Critter Getter, Foothill Tree Service, Mountain Democrat, Union Bank, Windfall Media, Arnolds for Awards, and ArborWorx Tree Service. Join over 10,000 followers of Placerville Speedway on Facebook, where you can keep abreast of updates for the 2018 season. 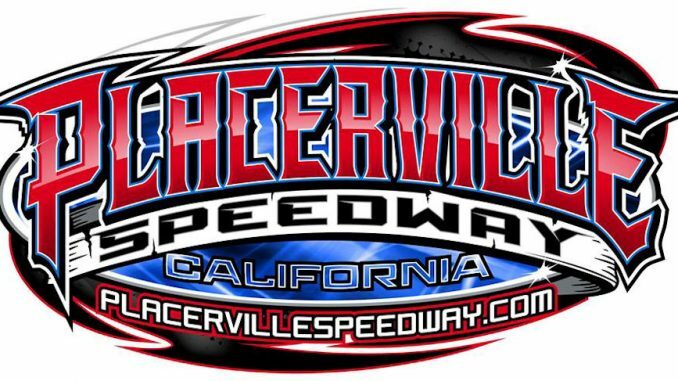 You can also find Placerville Speedway on Twitter by following us https://twitter.com/pvillespeedway – In addition, Placerville Speedway is also on Instagram. Please follow us @PvilleSpeedway. The quarter-mile clay oval is operated by Russell Motorsports Incorporated, which can be reached at the track business office at 530-344-7592. Contact Kami Arnold or Scott Russell directly for 2018 sponsorship opportunities at the office.